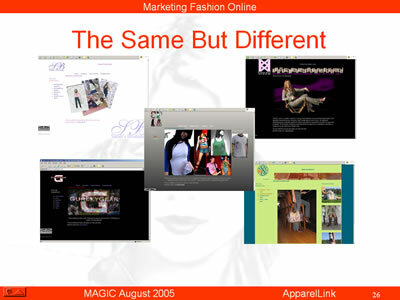 Here are five examples of ApparelLink Virtual Boutiques. While the underlying functionality remains constant, each Virtual Boutique reflects its owner’s idea of how they want their product presented. Their “grabber” image (store window), the product directory, the featured items, even the menu of the pages available to the visitor, in fact, all the content of the site is under the control of the store owners.